What food trend has your family embraced wholeheartedly? We’ve seen the cupcake craze, kale everything, and the “Sriracha with everything” trend. If I had to pick a favorite, I would probably choose the rise of the mighty avocado! Avocado toast has become a staple in my house. Is there anything that does not taste good with avocado??? But then some trendy foods end up like a “One Hit Wonder” song of the year. You try it once or twice but it gets old quick. Others become staples in our diets and meal plans. Incorporating a trend is an easy way to spice up dinner, learn new techniques or just have something fun to talk about at the dinner table. Here are the some trends we predict you’ll be hearing and tasting in 2018. And just wait to see how we apply them to meals you’ll discover this year in The Dinner Daily! The shift to incorporating more and more plant based foods into our diets is growing in popularity. Just pick up any health focused magazine and you will no doubt see articles outlining the benefits of having more vegetarian meals in our diets. Meatless Mondays, including just one vegetarian meal a week, and increasing your veggie intake are all consistent messages. And it makes a whole lot of sense to us too. Dedicated vegetarians love our weekly plant based meal plans but any member can dip their toes into the vegetarian waters by opting for 1 or more vegetarian meal/week. 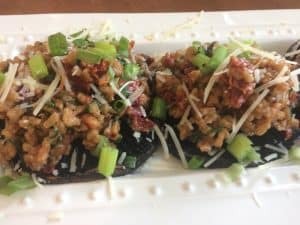 One of our favorite vegetarian dinner ideas is Farro Stuffed Portobello Mushrooms. If you have never tried farro, it is a hearty grain that has a wonderful nutty flavor and is very filling. If you can’t find farro or just dont’ want to go that far, substitute it with brown rice or quinoa. Spices are such an easy (and low calorie) way to introduce new flavors into food from different parts of the world. We’ve watched hummus and pitas become a mainstream snack. Watch for an explosion of middle eastern dishes and tastes. Look for recipes with spices such as harissa or cardamom and ingredients such as tahini, mint, parsley and eggplant. The Dinner Daily wants to serve up meals for the whole family. So if you’re a simple eater, go ahead and skip this trend. We make it easy to avoid spicy or international flavors. Simply click “Stick to the Basics” in your food preferences. But if you’re ready to give it a whirl, leave this box unchecked under your preferences. You’ll see recipes such as Beef Couscous or Turkey Skillet with Citrus Yogurt appear on your menu , which includes lots of middle eastern flavors such as couscous, cumin and coriander. Although this might be different flavors for your family initially, both of these recipes have been enjoyed by our members for years. This trend is being driven by the consumer demand for more natural food products, less sugar consumption and avoiding additives. Making homemade condiments is really simple and allows you the ability to customize each recipe for your taste buds. Here’s a simple way to dip your toe in the water. Try The Dinner Daily’s Make Ahead Salad Dressing Recipe. It’s easy, fast and delicious. If one of your goals this year is to get your kids eating healthier, let’s start with the processed chicken nuggets. It’s more than just for health reasons, they just don’t taste that great. Getting kids to love the taste of whole foods early on will go a long way in making them healthy lifelong eaters. Watch for recipes that have gourmet taste combined with a kid-friendly presentation. Plus, you avoid setting up the all so exhausting habit of one meal for the adults, one meal for the kids. Most of us don’t really want to be short order cooks during the week. An easy way to move away from frozen convenience food is to replace chicken nuggets with this recipe kids love, Chicken Schnitzel. Take small steps, and introduce new flavor profiles and ingredients one at time. This recipe was a weeknight staple for us when my kids were little and we still have it regularly to this day. “Good for your Gut” – Gluten free eating is more popular than ever. Taking that one step further is the inclusion of more super foods and medicinal ingredients in recipes. Super foods pack a punch of vitamins and anti-inflammatory power and include blueberries, brussel sprouts, bok choy and more. How To Try It: – All our menus include a wide variety of vegetables and fruits, including the ones listed above, such as the ones listed above. Members also have the option to receive only Gluten-Free recipes, such as “Chicken Beans & Tomato Bake” or “Chicken Cacciatore with Creamy Polenta”. Having a food restriction does not have to mean deprivation, it just means you need a plan to keep you eating lots of variety. What do you plan to try in 2018? Keeping a resolution to try new recipes, eat healthier, or save money at the grocery store are all easier to achieve with The Dinner Daily. Watch this video and click here to get a FREE two-week trial of The Dinner Daily.